Note: This post originally appeared on the Altantic. Real neighborhood experiences can provide a meaningful gloss on current discussions about how to make cities better and increase shared places for all. On Saturday night, in response to an email, I went to the movies by walking 100 feet from my home. Admission was free. And it was not in the comfort of an isolated home or downtown space, but among some 20 neighbors in an everyday place, hidden and in plain sight: Monica and Michael’s alley entry, against Anne and Jerry’s retaining wall. 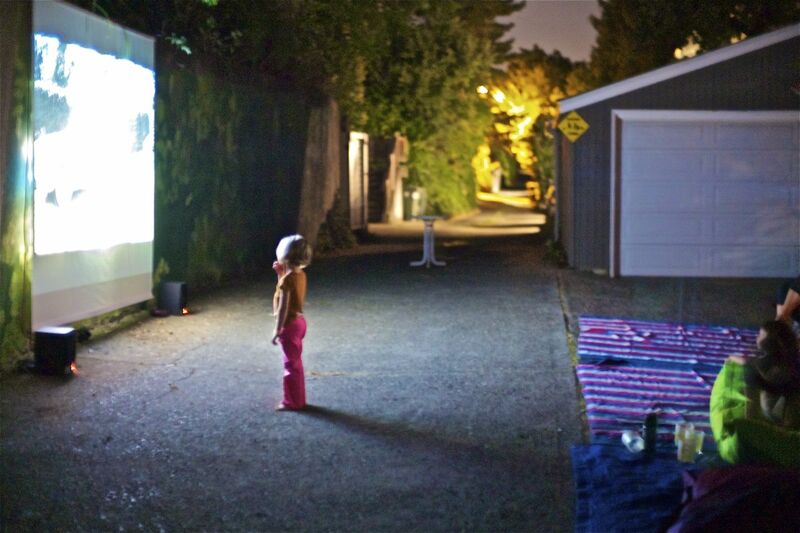 Our last “alley movie night” of the summer was an important reminder that a city neighborhood can experience community without really trying—an “urbanism without effort” that needs no thought leadership nor sound bytes, and is as natural as European street life in places we sometimes wish we were. We can try awfully hard—sometimes too hard, in my opinion—to extol the virtues of the city by proselytizing and debating ideas and opportunities. 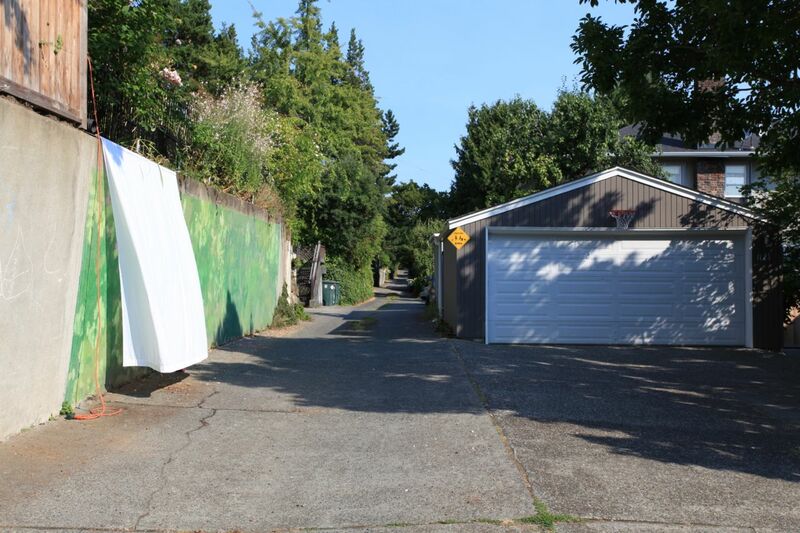 In particular, the potential for American urban alleys remains in the spotlight. This attention, often aspirational, is well deserved given the raw alley palette for remade narrow streets in the organic European tradition, pedestrian in scale, narrow, interesting and a natural focus for greening street life and new small businesses. Recently, additional essays (e.g., Alyse Nelson writing in Sightline last week) have recalled alleys’ placemaking role within the urbanist toolbox. Specific, grant-funded work by Seattle’s Daniel Toole has emphasized the now iconic, reclaimed laneway precedent of Melbourne and beyond. The challenges, of course, are how to pay for reclaiming and maintaining these alleys. And, as with many instances of infrastructure improvement, we must determine where and how the private sector can make a difference in implementing improvements and maintenance too costly for today’s municipal public transportation and utility agencies. After all, it’s not just about clearing away the dumpsters. As I’ve related before in contributions to the urbanist dialogue (in myurbanist and on Seattle’s KUOW radio), public rights of way, stormwater system maintenance, pavement resurfacing and other forms of street improvement may be required in order to materially reinvent desired space. Yet, in the meantime, there are ready and simple victories in residential alleys less known or described, where neighborhood is there for the taking. Admittedly, not all of us have traditional alleys at our back doors (which we often treat as main entries), but those of us who do can readily avail ourselves of the once and future urbanism of alley reinvention. Those of us who don’t might find a driveway and garage to suffice for now. 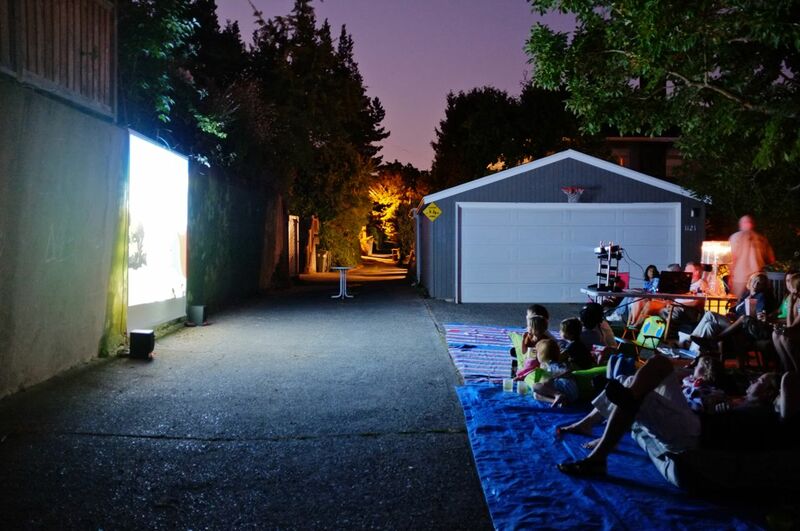 Email, potluck food and drink, equipment setup, and a bedsheet-as-movie-screen yield public space for community, not because of doctrine or dogma, but because it is as natural as the place next door. The best urbanism is that which is already there to be nurtured, a practice that I highly recommend. Charles R. “Chuck” Wolfe, M.R.P., J.D., is an environmental and land use attorney in Seattle and an Affiliate Associate Professor of Urban Design and Planning at the University of Washington. He writes for several publications, including The Huffington Post and Crosscut, and blogs at myurbanist. All images composed by the author. Click on each image for more detail. Excellent recognition, Chuck, that ones immediate residential sphere is the core building block to great neighborhoods, and there for great cities. If we all would make the effort to get along with those next-door every town and city would be greatly improved. Truly great stuff. There are myriad great ideas and opportunities for making our cities better places, but as with so many things: small is beautiful. No doubt, it’s importance is only heightened in a time of tighetening public outlays. This idea of “urbanism without effort” also underscores that true urbanism is not determined by building stock, streetscapes, or transit networks, but rather, it is fundamentally a mindset. I truly believe that shifting this public mindset will reshape the urban landscape in more wonderful ways that even the most prescient urban planners can dream up.